Gospel Echoes will hold a Dessert Reception, Thursday, February 21, 2019, 6:30 PM at the Brethren Community Fellowship Hall, 3731 Woodland Ave., Modesto, CA The evening will include Gospel music by the Gospel Echoes Harvest Team, Prisoner Testimonies, Fellowship, Grader Recognition, Inspirational Ministry Update and a Multi-Media Presentation of the prison ministry. Please RSVP to Terry Boone via text, phone call or email, 209-402-1525, terrylboone@comcast.net. Event Sponsors have helped to financially carry this ministry in California for the past 30 plus years. This year we are encouraging Scholarship Sponsors. $1000.00 will sponsor 40 and $500.00 will sponsor 20 inmate Scholarships for the Bible Study Correspondence Program. This covers the primary cost of the Eight-Series Course, Certificates and an Award Bible. 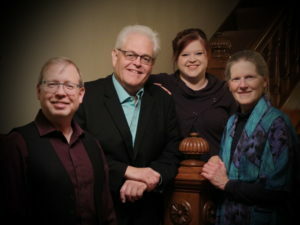 The Harvest Team is led by Glendon and wife Lorna Bender who have been with Gospel Echoes for the past thirty-eight years. Team members include Delbert Yoder. Gospel Echoes serves over 700 prisons bringing a message of hope to prisoners throughout the U.S. and Canada. A free will offering will be received for the prison ministry.